Courthouse from the West. 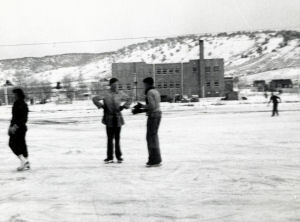 Photo from the Eagle traditional outdoor ice rink in the park. The community of Eagle was barely taking shape in 1895 when the fight for the county seat began. The up-valley mining camp of Red Cliff had claimed “county seat” status since the county was formed in 1883. The residents of Eagle wanted that designation and the status and economic benefits that came with it. The pitched battle between the two communities lasted over 20 years and involved four elections. In 1921, Eagle finally won. County offices were housed for the next 11 years in the Woodman Hall building on the northwest corner of Third and Broadway. The community’s next challenge was to provide an adequate county courthouse. 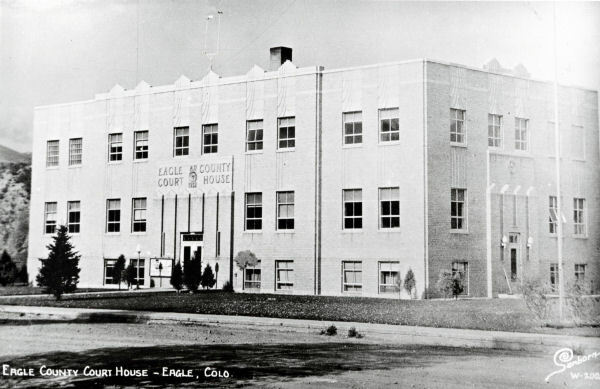 Community leaders had previously donated the land for a new courthouse, to be located across Broadway from the Eagle School (where the new county administrative office building is today). 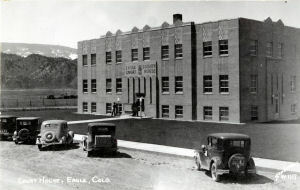 In 1932 Eagle County hired an eminent Denver architect, C. Frances Pillsbury, to design the three-story Art Deco-style building which would house all the county offices. Workers spent a year constructing the $65,000 building, which featured terrazzo floors over a cement foundation, metal window sashes, and a modern coal-fired steam boiler that kept the wall radiators warm. The sheriff’s office was located on the lowest floor (basement level), along with living quarters for the custodian whose wife cooked for the jail prisoners. The second floor housed the county clerk, assessor, treasurer, and county school superintendent’s offices. The third floor was dominated by the county jail and the District Courtroom and judge’s chambers. 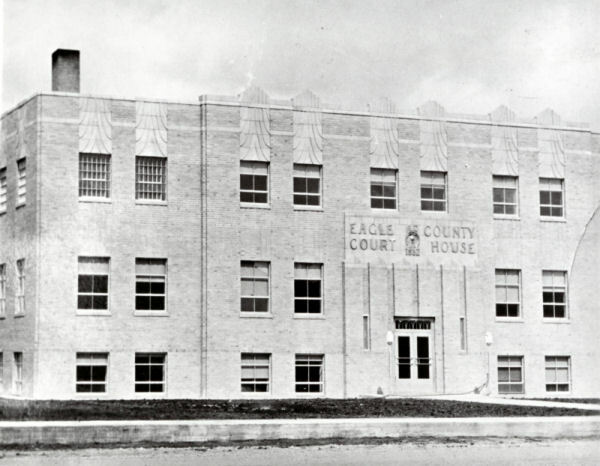 The courthouse included an abundance of fire-proof vaults – two on the third floor for court records, three on the main floor for county records and one in the basement where the sheriff could store evidence. An out-of-sight back stairway allowed the sheriff to move prisoners from the basement up to the jail without going through public hallways. Still, over the years there were several escapes from the third-floor jail. As the county grew, so did its space needs. In 1990, the new administration building was constructed directly across from the old building. The old courthouse was remodeled and continues to house county offices. The sheriff’s office, jail and courtrooms have been relocated to the new Eagle County Justice Center on Chambers Avenue.